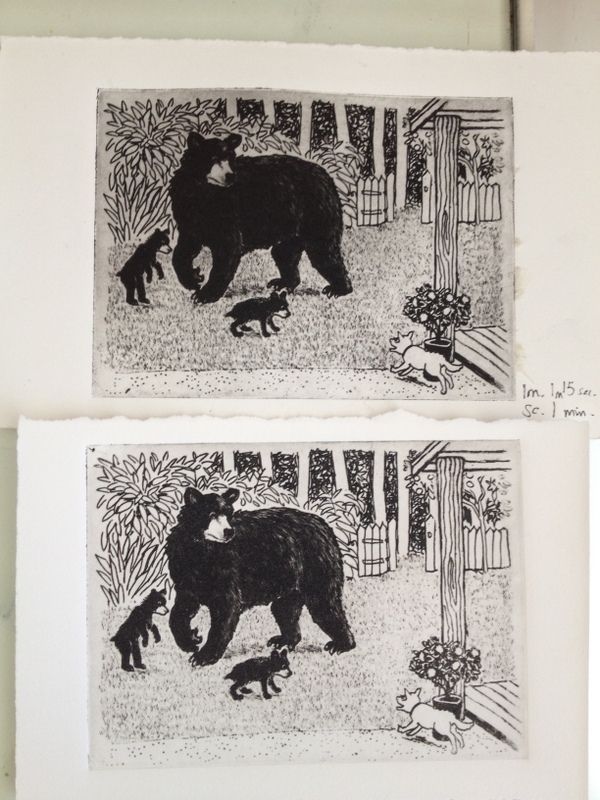 The latest project I’ve been involved in is the ‘Bears and Blooms’ print exchange run by Bittondi Printmakers’ Association in aid of the Free the Bears fund. 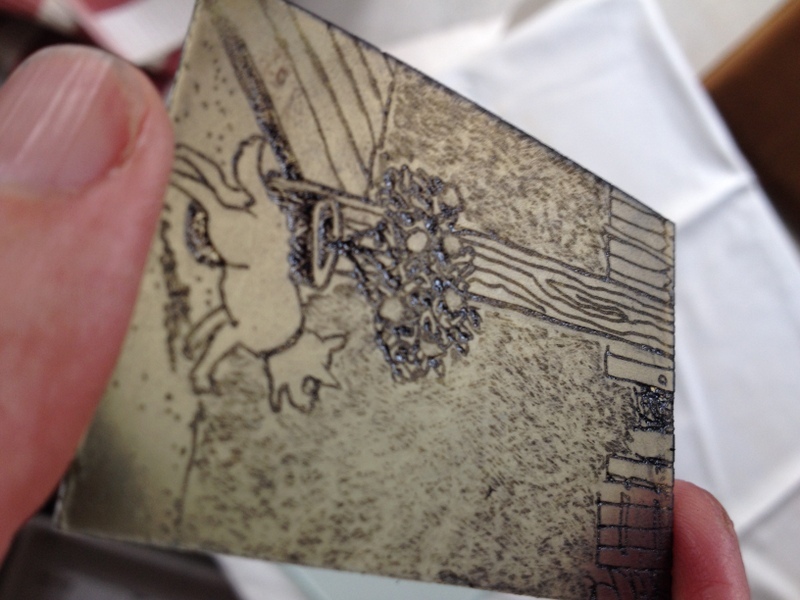 The image had to be very small, and although I was tempted to make a wood engraving I had very little time. 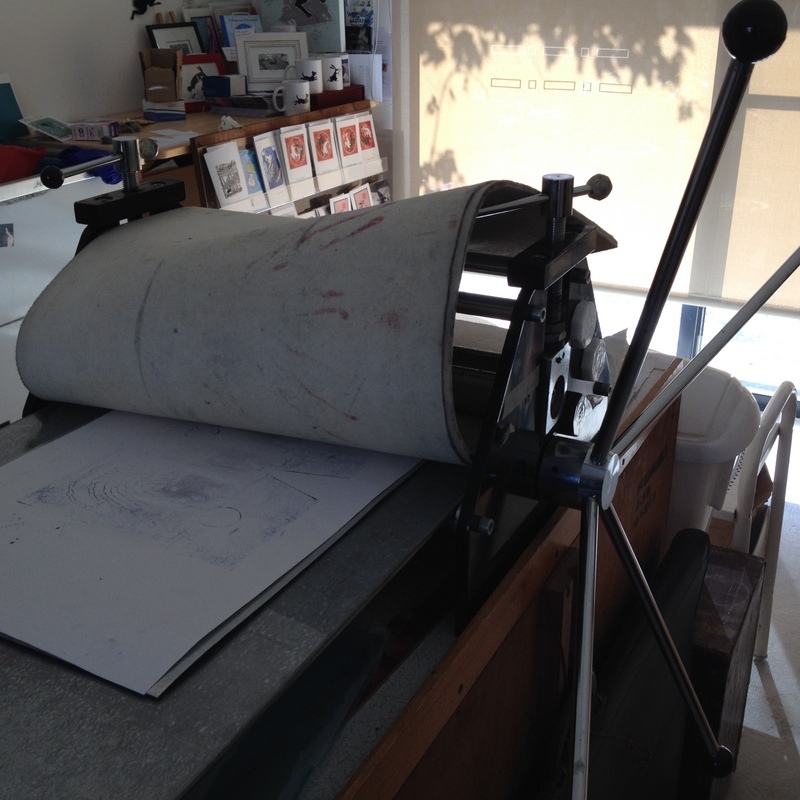 So photopolymer was the answer – a detailed pen drawing could be reproduced as an etching in the space of a day. 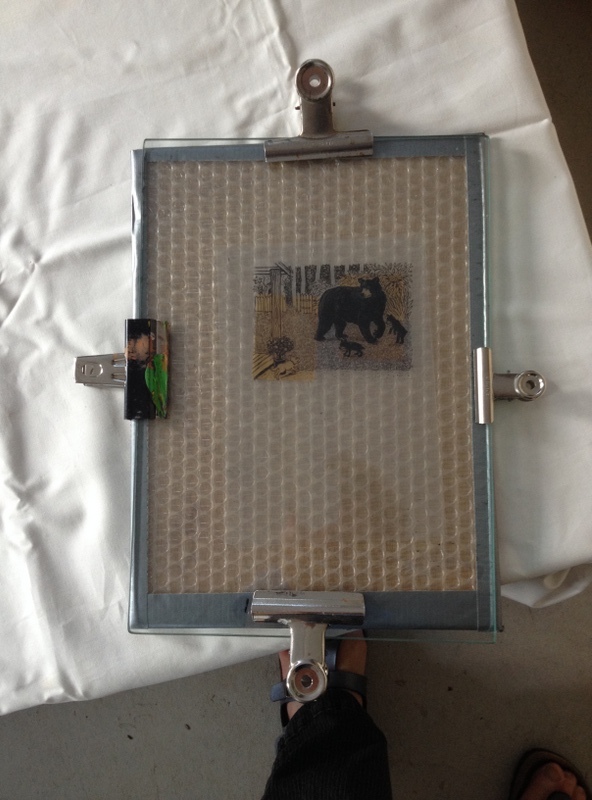 As you can see, the drawing was made with a Sharpie on OHP film, the stuff we used to use for overhead projectors. The bear was given density with a broader Sharpie that is not so opaque, so I was hoping for a half tone rather than dense black. I added darker strokes with the finer Sharpie and scratched some of the tone out to give highlights. The grass took ages – I added too many fine strokes in the end, so scratched some of them out again. The beauty of working on film is that the lines are always crisp, and it’s so easy to change your mind and alter things. But beware of smudging with your hand! The next stage is to make some test strips. 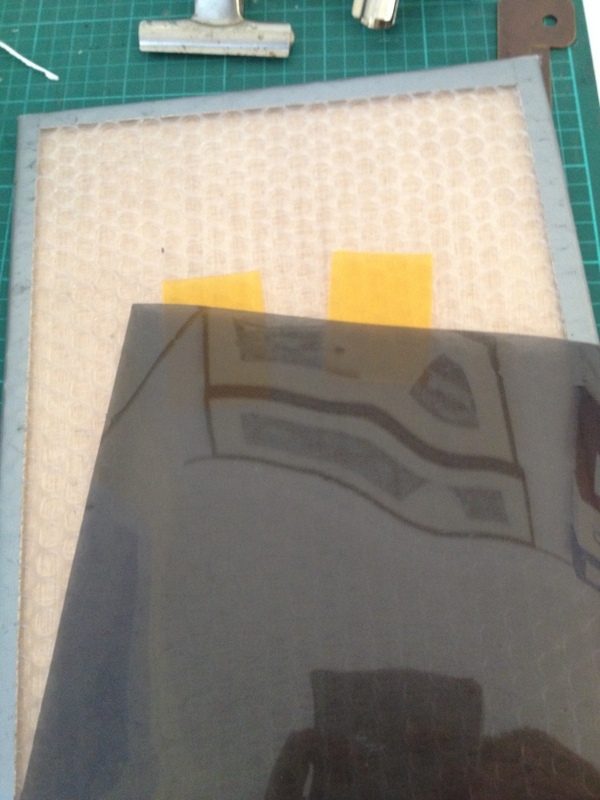 The photopolymer plate that I use has a plastic foil backing, so it’s easy to cut with a knife. 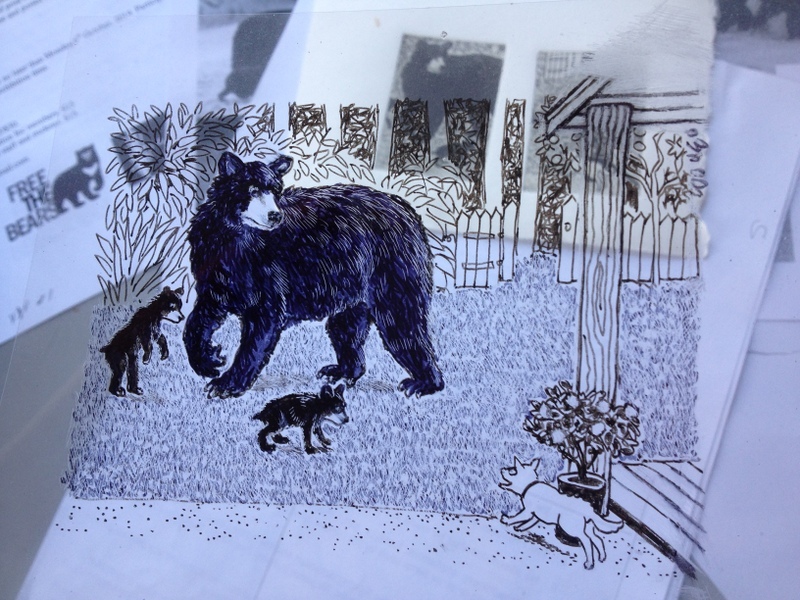 I put two strips in different parts of the drawing: in this case one is under the bears, the other is under the grass, the dog and the rose bush. 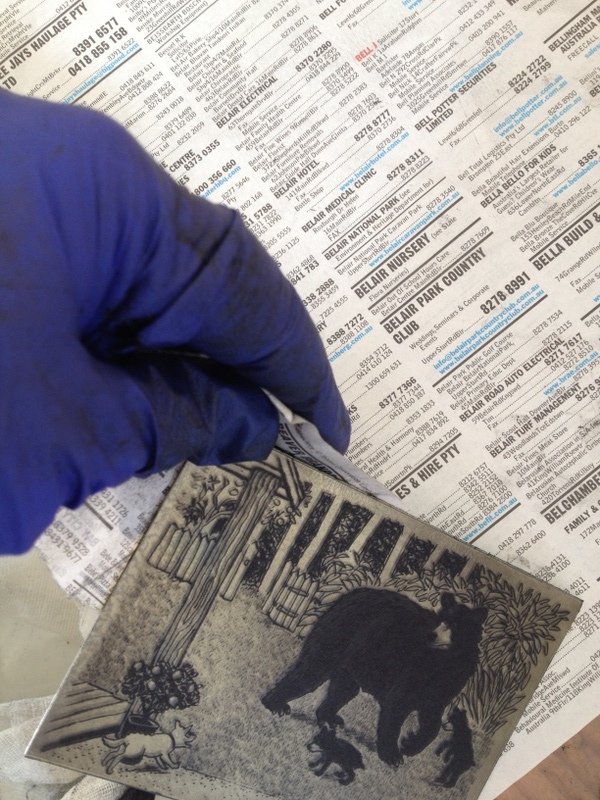 Note the image is upside down on the plate, so after the plate is exposed it will print the image the right way round. This is an exposure frame, made from bubble wrap taped onto an MDF board. One more thing: as the ink often comes off onto the plate during exposure, there is another piece of film protecting it from the plate. 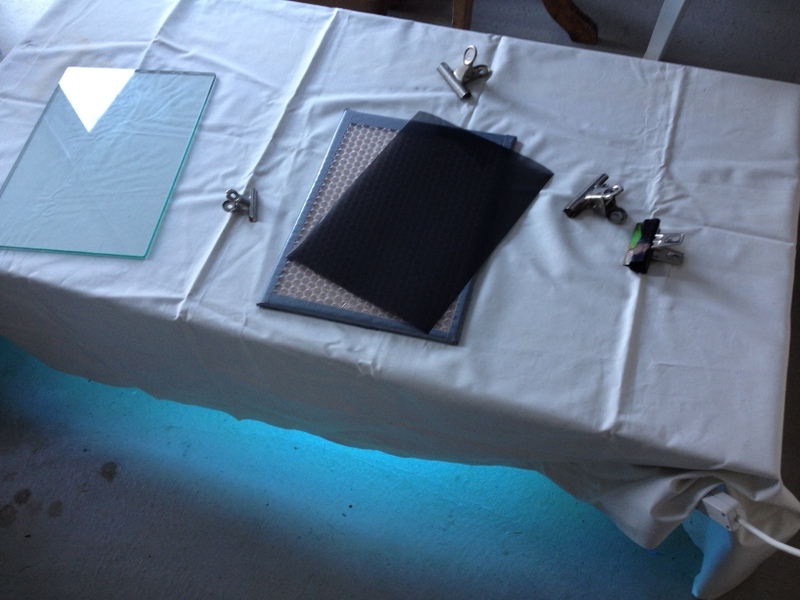 A piece of glass is clipped onto the exposure frame. Now it’s ready to go under the UV lights. I always give the image a minimum of one minute, then I expose the same plates to a dot screen, known as a stochastic screen, for a further minute. The shinier side of the screen should face upwards. The next stage is to wash the plate, for a maximum of one minute, in water. 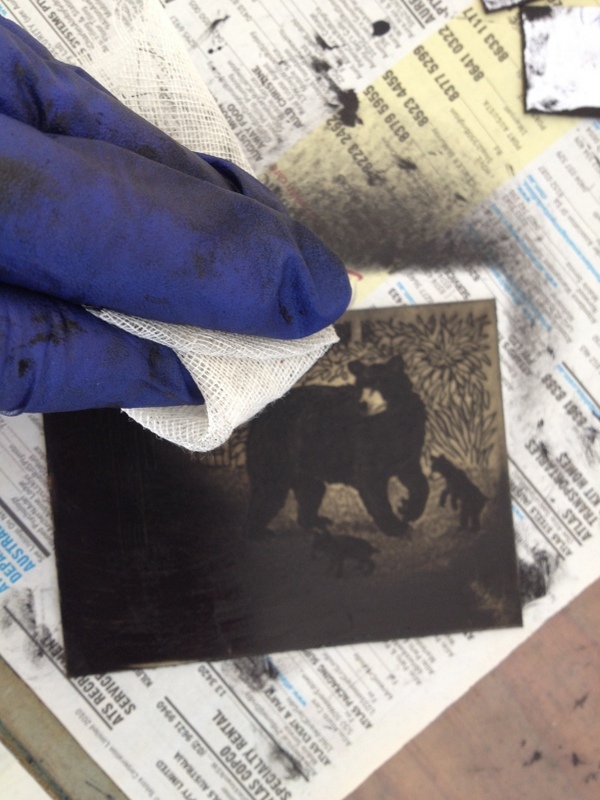 I use a soft sponge to wash out the unexposed photopolymer. Then I dab the plate dry with kitchen towel. If the plate is very sticky at this stage, it’s been under exposed. It should be just slightly tacky, so change the towel after the first mopping. Finally, leave the plate to dry in the sun for a few minutes (don’t let it blow away)! or if you’re working at night, put it under the exposure unit again. This test strip has had too little screen exposure, while the image had over two minutes. You can see it’s etched deeply in the black areas. This means that the ink will not stay in those areas, and you won’t get rich blacks. Here the image had under one minute, while the screen had a whole minute. When I inked it it produced a grey image, and had very little texture in the fur area. My best result was exposing the image for 1 minute 15 seconds, while the screen had a standard exposure of 1 minute. When you’re inking up, it’s a good idea to do several test strips at once and compare them. 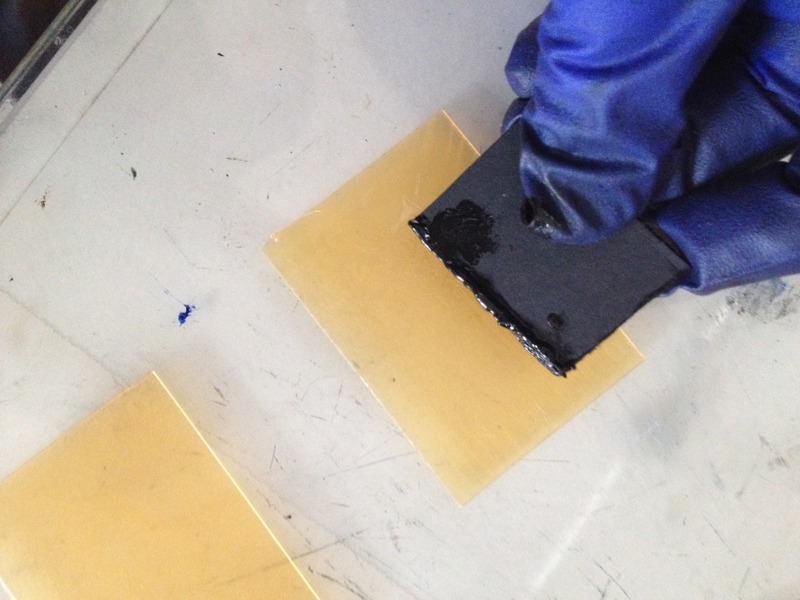 Use a small strip of cardboard to spread the ink across the plate, then use a clean piece to take most of the ink off the surface. Here you can see the difference between an underexposed and a better exposed image. But the image at the top still lacks some detail, so I decided to expose the plate for longer. On the other hand, this image has had far too long. The dark areas show ‘open bite’, meaning the dense black has given way to patchiness. The bear looks mangy! Although you can print your test strips without a backing, once you have decided on your final exposure, it’s a good idea to stick the plate to a metal backing with strong spray glue, or it will start to curl up at the edges. 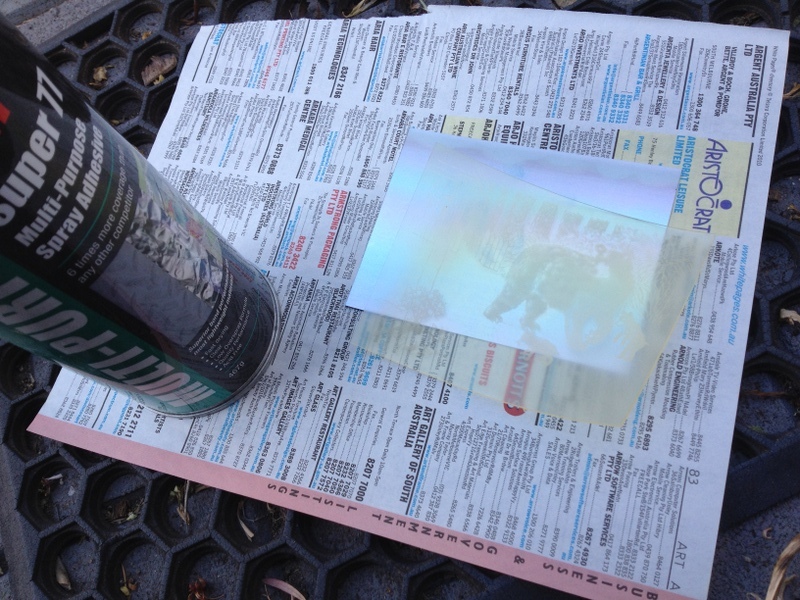 I use aluminium sheets that are used in the printing trade. They can be cut with a Stanley knife, like the plate itself. This is my final plate, stuck to a metal backing. 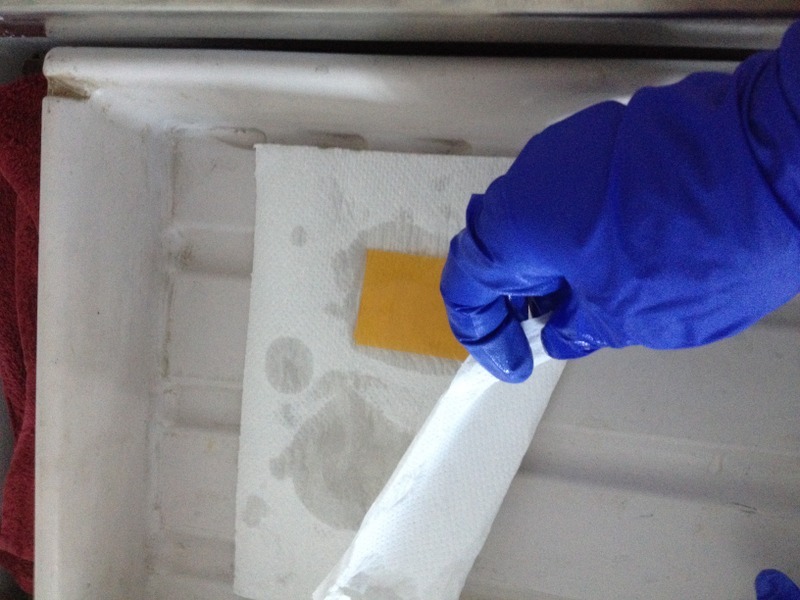 I’m wiping the ink in a circular motion off the plate with a piece of tarlatan (called scrim in the UK), being careful to use fresh yellow or white pages underneath as the plate becomes cleaner. 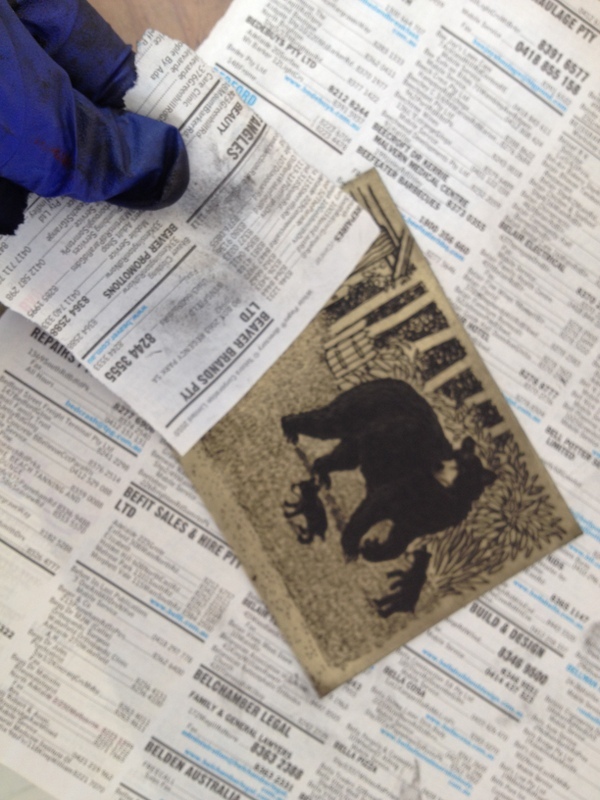 Some final wipes with several pieces of white pages ensure that the surface is as clean as you can get it. Always remember to wipe the edges and the back of your plate before you print! This is my little press. The blankets don’t look too clean, but that’s dried ink left over from a few careless workshops. The paper under the blankets normally protects them from any accidents. That doesn’t look too clean either, but it’s dry ink that won’t mark the blankets. 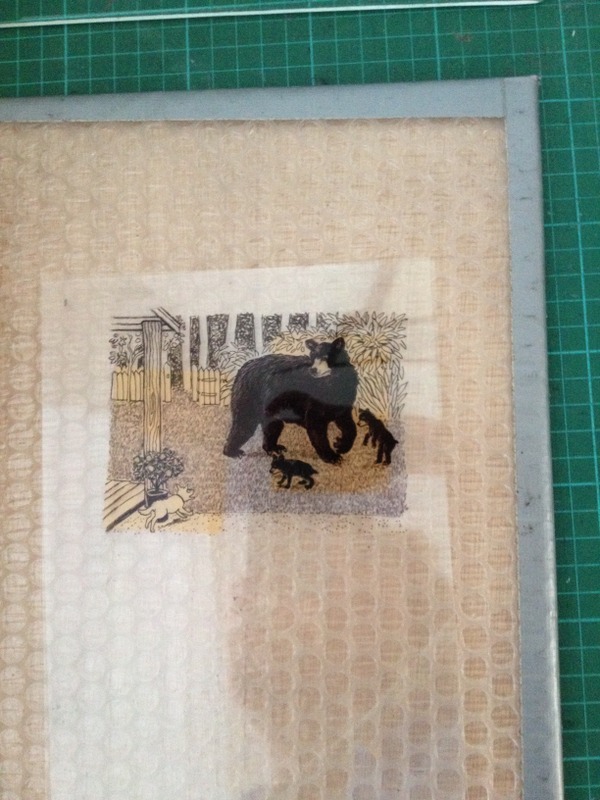 Under the protective paper is a piece of etching paper, face down on top of the plate. 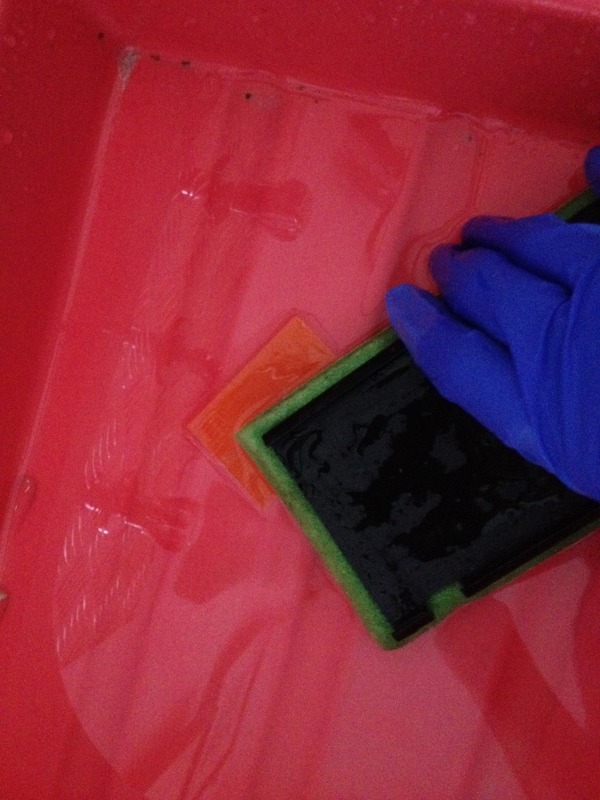 With photopolymer you don’t have to soak the paper – water can harm the plate. I sometimes lightly dampen the paper to ensure it picks up the ink properly. 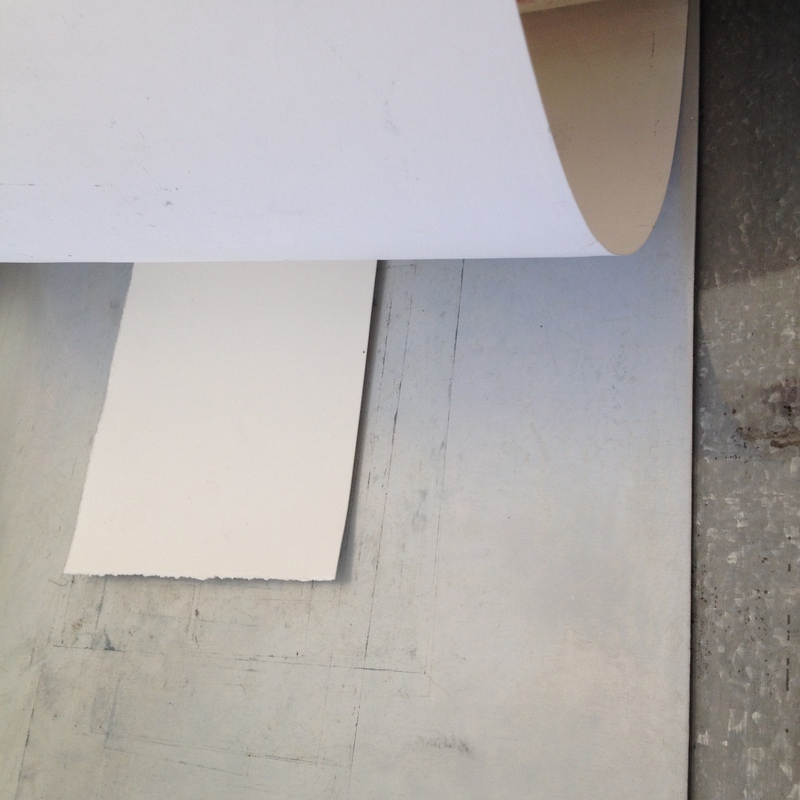 I use a large metal sheet under the plate, which raises the bed and makes it easier to reach the right pressure. This shows you how subtle the difference in inking can be. 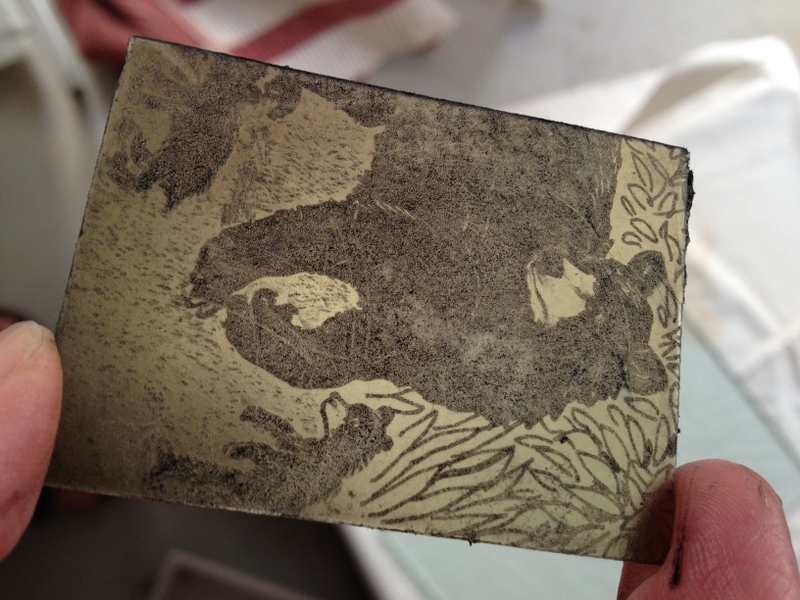 The first print was over inked and I lost some detail in the bear’s fur, but the grass is more pronounced. 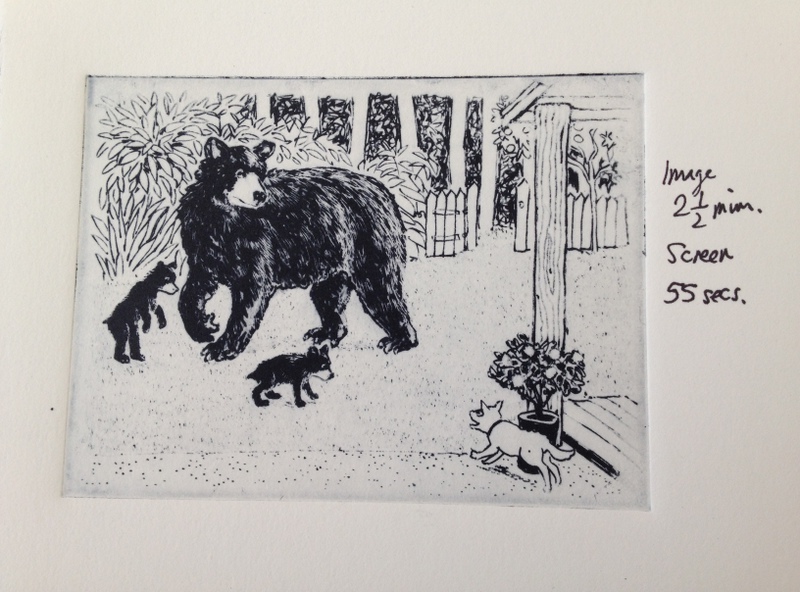 In the second print I added a little extender to the ink and polished the plate more thoroughly. If you add extender to your ink you can increase the detail with very little loss of darkness. Tip 12: Join a print exchange! Tip 11: You will never stop learning new techniques! Go global! | Mi Mi D… on Tip 13: Go global!